My students use their iPads as creators every day, whether they are recording their thoughts, using virtual tools or publishing authentic assessments. Content can be both created and consumed using an iPad, and my students take on both roles. There are abundant resources for content consumption, and these apps can be used to teach current events. Many schools are increasing their use of informational and multimedia texts in order to align their instruction to the Common Core Learning Standards. It's important to acknowledge that current events are more than just articles in a newspaper. There are a variety of free iPad apps that students and teachers can use to access high-interest texts and video clips that will connect your classroom to the world. This app is in my top ten for personal use, and it has a clear place in your classroom. Watchup allows users to create a custom newscast by choosing clips from different news outlets. Combine an interview from PBS Newshour with a story from Euronews and a clip from CNN in a personalized news program. Whether you use this app to stay up to date on local and global news, share stories with your students, or find inspiration for a lesson, Watchup should definitely be added to your short list of apps for current events. There are lots of ways to introduce current events into your classroom, and documentary films can be a powerful tool. If you're looking to capture your students' attention with a dramatic film, the SnagFilms app brings documentaries to your fingertips. SnagFilms offers a variety of award-winning documentaries covering subjects that range from sports to animal life to politics. This app can be used to show a clip to a small group or inspire a class starting a new project or unit. I know that when I'm looking to deepen my understanding of a current events topic or learn more about the content I'm teaching, a documentary can help me prepare. One reason I love the NPR app is the multiple ways to access multimedia informational text. Not only is the content of this app up-to-date, it's presented in ways that can reach students at a variety of levels. Whether you're looking for an interview, news recap or feature story, NPR is full of resources for current events. Some stories even have audio features so that students can hear the recording and read the text straight from the app. Whatever your "go-to" network is for the evening news, the NBC Nightly News app is worth checking out. The clips are well-organized, and easy to navigate and share with your students. If a news story connects to my social studies or science unit, or relates to a topic in a book club, I'll show the clip to a small group or my whole class. 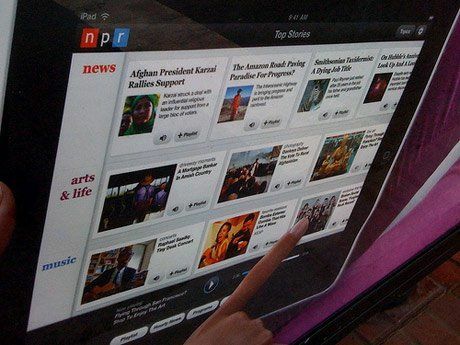 CBS News and ABC News also have free iPad apps full of useful content and resources. There are so many ways to integrate TED Talks into your instruction, since the themes of these presentations often connect to topics important to many teachers' current events lessons. TED Talks are short lectures from people at the top of their field who focus on a specific argument. I've used a clip on biolumenescience to extend a guided reading lesson with my fifth graders. It captured their attention despite being geared for an adult audience. There are TED Talks given by children and well-known figures. Presentations are designed to be downloaded to your iPad for offline viewing. What online resources to you use to find current event stories for your students? Are there any iPad apps you can't live without?